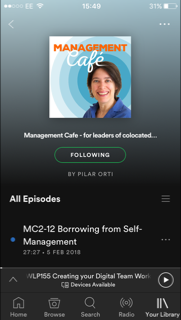 01:09 Pilar introduces the podcast and the feedback loop. 03:40 How technology is helping us to give feedback and what it's addressing. 11:05 A story from Paul Matthew's Capability at Work illustrating the need for feedback across the organisation. 16: 45 Virtual Coffee with Lisette. Why the annual appraisal is not the best place for feedback, especially in virtual teams. 22.25 Written feedback (and some non-written specific points!). 31.30 360 degree team feedback. This conversation was a follow up of something we started talking about in episode 3, where Lisette was talking about how she might have contributed to a working relationship that didn’t quite work out, when she was working for someone else. The question of feedback and that it’s not always just the boss’ or manager’s role to give feedback came up. When I think of feedback, I always think of the physiology type of feedback where organs, muscles, neurons, hormones are constantly talking to each other and affecting what happens next. But for some reason, when I talk of giving feedback in an organisation, I always picture it as coming from the top, the higher layers in the organisational chart. It would be interesting to hear what you think about this. So, during the chat with Lisette, we don’t talk about how to give feedback in a formal way, during a coaching session or an appraisal but we cover a number of other topics, and Lisette has some very specific information to offer you. As always, I’m more concerned about some of the issues that are being highlighted by the specifics, but Lisette has some valuable tips for you, after having a look at how different people are dealing with feedback in a range of organisations. She talks about how to give written feedback in a virtual team, she introduces Team retrospectives and she talks about 360 degree team feedback. I think a big part of the feedback conversation is the realisation that we are all responsible for making the workplace better, for working as best we can. For example, if we’re constantly stepping on someone else’s toes, but no-one tells us, how are we going to change? Or, how are we even going to consider changing? I know, it’s also true that some people are stubborn (I’m probably one of them) and selective in how they listen to feedback, but I’m always amazed by the number of people who keep pointing out someone’s behaviour at work, something that is impacting on their work and yet… they don’t say anything. Well, how else can you make sure there is a possibility of change? And yes, I know that the environment or work culture is not one in which we can say anything, I’m aware that many organisations are far from ideal, but sometimes we think we are more powerless than we really are. And having said that, before I continue, remember that everything that Lisette and I say in this podcast is our opinion and that it’s up to you to take our advice or not. Before I move on to our virtual coffee, I thought I’d talk about how technology is being developed to help us with giving feedback. Yes. Probably technology solutions are being introduced because we’re constantly looking for ways of bringing people together and the easiest way now seems to be through technology. So, reading an article on Entrepreneur.com titled How to Become the Zappos of Your Industry, I came across the two applications that are helping organisations to keep feedback integrated in regular conversations. Funnily enough, they are both being used by the company the writer presides over, not at Zappos itself. Just a reminder that Zappos is the shoe online retailer that has become THE place to work, the place with a strong culture that looks after its people and its customers. The author of this piece is Darius Mirshahzadeh and he is the president of Endeavor American Services. In the last point of the article, under the point Use Software, he mentions two platforms his company uses. I’m always a bit weary of trying to replace the face to face – or equivalent- conversation with an asynchronous platform but, I thought I’d share this with you because some of the things these platforms are trying to replace, or in some cases add, are well worth looking at. The first platform that Darius Mishahzadeh mentions is YouEarnedIt. It, and I quote him in the description of this tool: “it rewards one another for superior work that’s aligned with the company’s core values”. So it’s not skill-driven or performance-driven it actually encourages you with behaviours that go beyond that. It reminds me of something that Lisette mentions in our virtual coffee, that if you’re being asked to give feedback on someone else’s performance, like another team member’s, it’s sometimes difficult to know where to start. But by looking at something like whether we think they embody the organisation’s values, we already have some guidelines. This might be particularly useful if we’re introducing some kind of culture change or whether there are certain values that we want to embed in the organisation. The other thing I like about the thinking behind this platform is that it encourages instant recognition, going back to what I was mentioning before, of encouraging ongoing feedback. Also, the fact that it’s employee driven, not just management driven – and Lisette has some interesting things to say around this too. So I had a quick look round the platform of YouEarnedIt, which by the way, have “chronicling daily happiness” as the tag line. (I’m in no way connected to the company or endorsing this product as I haven’t tried myself, but I thought it was worth sharing with you my thoughts.) There’s a social recognition feed, so that all employees can see who is being recognized for what and you need to allocate a company value to it. Everyone can also see the metrics of this process. I’m in two minds about this all because it seems to sterilize a bit the whole values/behaviour/recognition conversation. But on the other hand, as long as it’s adding to what’s already going on and not replacing it… Well, do have a look at the platform and let me know what you think. The important thing to remember is the kind of behaviours it’s trying to encourage and whether you agree with them or not, that’s the conversation I’m trying to get going with yourself and your team. So, the second bit of software I had a look at was 15five. And Lisette talks about this concept too, although she doesn’t mention this bit of software. Darius Mishahzadeh’s staff take 15 minutes each week to jot down feedback to a supervisor that takes just 5 minutes to read. And again, more than the exact method, it’s the concept that they’re embracing that’s interesting: feedback doesn’t need to take too much time, that it doesn’t have to be formal and that it needs to be regular. This last one I think is very powerful, because many times, people will not mention that they’re stuck. Sometimes, it’s only when a question like this one is asked that they realize what they’re stuck on, that they pinpoint what the problem is and I assume, many times, that is enough to unstick them. So as I said, it’s an interesting presentation of a feedback process. What I did notice though is that it’s still presented pretty much as a top down approach. “The employees answer insightful questions” and I’m quoting from the site. “Managers respond and support.” “Executives stay informed.” However, you can then use it however you want as Mishahzadeh mentions, he uses it for people to give feedback to their supervisors too. Like with all tools, we need to continually ask ourselves why we’re using them and what we’re trying to achieve with them. These tools are going to get ever more popular as people continue working with each other while physically apart. But we need to continuously question what they are replacing and what they are adding to our process and continuously evaluate. However, these tools do make me think that there are some important concepts about feedback that we need to bear in mind. It needs to flow, feedback needs to be something that is not unidirectional, because it tells us not just we’re doing as people but also how the business is doing, what’s lacking to help people operate at their best.
. He actually uses it to illustrate the difference between capability and capacity but I think it goes beyond that. Imagine you are driving, on your way to taking your children to an important football practice. You hear a strange noise coming from the bonnet of your car. You stop at a garage and the mechanic, as soon as he hears the noise, knows what’s wrong and what needs to be done to be fixed. He says all you need is an inexpensive part to be replaced and in ten minutes you will be on your way. So, this might result in you going somewhere else straight away, to another garage, who can replace the part immediately because it’s in stock and this garage then becomes your first point of call next time you have a problem. Again, Paul uses this to illustrate a slightly different point but I’d like to use this as an example of a business that doesn’t have an ongoing system to give and receive feedback or the culture to encourage this. In an ideal world, you would have the mechanic call whoever is responsible for stock or even for customer service (and this might be the owner) to tell them of this. Or, in their weekly chats, he might want to bring it up. Or their boss, whatever form he/she takes, could ask, have you noticed anything that stopped you from doing your job well or anything the business could be changing? But we need to have these conversations regularly so they’re not a big deal. I always think of a freelancer friend of mine who works for a small company, and of how nervous he was when he went for lunch with his boss who wanted to talk about offering him some more work. His boss is lovely but they don’t have the habit of meeting up to talk about work as a team, let alone one-on-one’s with the business owner. This was a conversation my friend was looking forwards too and yet he was nervous. Can you imagine if he needed to raise an issue that was affecting the business? If you listen to the podcast and enjoy the Virtual Coffee with Lisette, why not listen to her very own Collaboration Superpowers podcast?